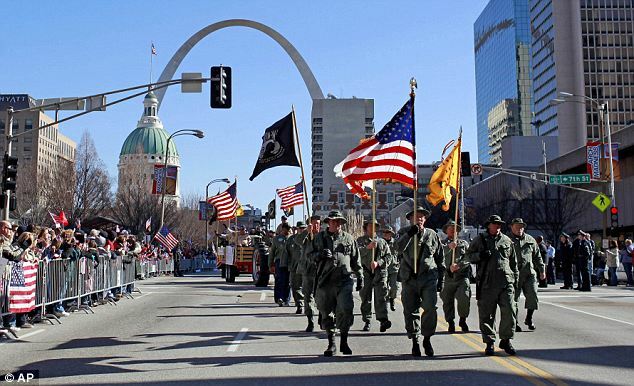 Crowds of nearly 100,000 in St. Louis honored Iraq war veterans in the first big welcome-home parade since the last troops were withdrawn from Iraq in December. The moving St. Louis event brought tears to the eyes of Army Major Rich Radford. “It’s not necessarily overdue, it’s just the right thing,” said Rich Radford, a Army veteran who served 23 years in the force and walked in the parade alongside his 8-year-old daughter, Aimee, and 12-year-old son, Warren. Rich Radford was among about 600 veterans, many dressed in camouflage, who walked along downtown streets lined with rows of people clapping and holding signs with messages including “Welcome Home” and “Thanks to our Service Men and Women”. Fire trucks with aerial ladders hoisted huge American flags in three different places along the route, with politicians, marching bands – even the Budweiser Clydesdales – joining in. The large crowd was clearly there to salute men and women in the military, and people cheered wildly as groups of veterans walked by. Tom Appelbaum, an attorney, and Craig Schneider, a school district technical coordinator, decided something needed to be done. So they sought donations, launched a Facebook page, met with the mayor and mapped a route. The grassroots effort resulted in a huge turnout despite raising only about $35,000 and limited marketing. Veterans came from around the country, and more than 100 entries – including marching bands, motorcycle groups and military units – signed up ahead of the event, Tom Appelbaum said. Craig Schneider said he was amazed how everyone, from city officials to military organizations to the media, embraced the parade. “It was an idea that nobody said no to,” Craig Schneider said. All that effort by her hometown was especially touching for Gayla Gibson, a 38-year-old Air Force master sergeant who said she spent four months in Iraq – seeing “amputations, broken bones, severe burns from IEDs” – as a medical technician in 2003. “I think it’s great when people come out to support those who gave their lives and put their lives on the line for this country,” Gayla Gibson said. With 91,000 troops still fighting in Afghanistan, many Iraq veterans could be redeployed – suggesting to some that it’s premature to celebrate their homecoming. In New York, for example, Mayor Michael Bloomberg recently said there would be no city parade for Iraq War veterans in the foreseeable future because of objections voiced by military officials. In St. Louis, there was clearly a mood to thank the troops with something big, even among those opposed to the war. “Most of us were not in favor of the war in Iraq, but the soldiers who fought did the right thing and we support them,” said 72-year-old Susan Cunningham, who attended the parade. Several veterans of the Vietnam War turned out to show support for the younger troops. Among them was Don Jackson, 63, of Edwardsville, Illionis, who said he was thrilled to see the parade honoring Iraq War veterans like his son, Kevin, who joined him at the parade. Kevin Jackson, 33, an Air Force staff sergeant said he’d lost track of how many times he had been deployed to Iraq and Afghanistan as a flying mechanic. “It’s extremely humbling, it’s amazing, to be part of something like this with all of these people who served their country with such honor,” Matt Wood said.